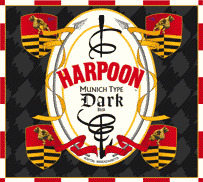 Personally, this is my (Ian's) favorite of the five Harpoon year-round offerings. It pours a deep caramel color with a frothy, light-brown head. Good lacing over a murky body. We liken the appearance to that of maple syrup. Malty aroma with hints of grain, bark, toasted honey-wheat bagel, and caramel. Initial taste is sweet which carries right through to the finish. Short duration on the mouth. Creamy with soft carbonation once it's down the hatch. Delicious.